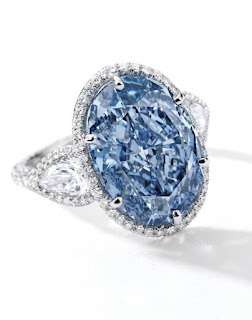 The largest oval fancy vivid diamond ever to appear at auction is headed for sale in Hong Kong next month, where it is expected to fetch $30 million – $35 million. 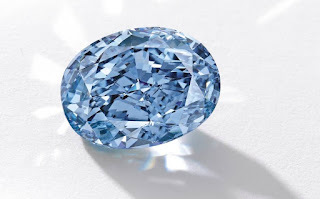 The internally flawless blue diamond, at 10.10 carats, was mined in South Africa and is one of a collection of 11 cut by jewellers De Beers in London in 2000. 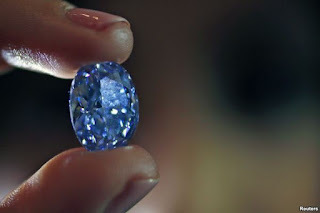 “Blue diamonds are extremely rare and when they are over 10 carats and flawless, they are quite special,” Quek Chin Yeow, Sotheby’s auction house Deputy Chairman for Asia said at a press event in London. 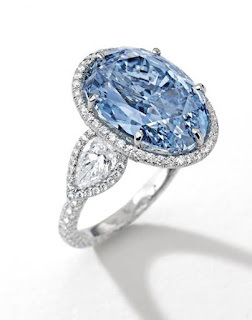 The blue diamond will lead an April 5 Sotheby’s auction in Hong Kong after being exhibited in London, Geneva, New York, Singapore and Taipei. Note: The above post is reprinted from materials provided by Reuters.